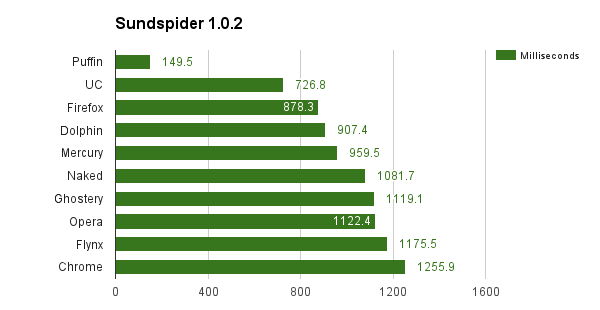 In this article, we describe the test speed and memory consumption of ten popular browsers for Android. I bet that the results will surprise you. It’s no longer a secret that the desktop familiar to us are gradually fading into the past, and they are replaced by mobile devices. Indirect evidence of this is the fact that the share of mobile traffic is almost equal to that share of the ordinary, and in some regions of the world, even exceeded it. In light of these trends is particularly acute raises the question of choice of the best browser for mobile Web surfing. 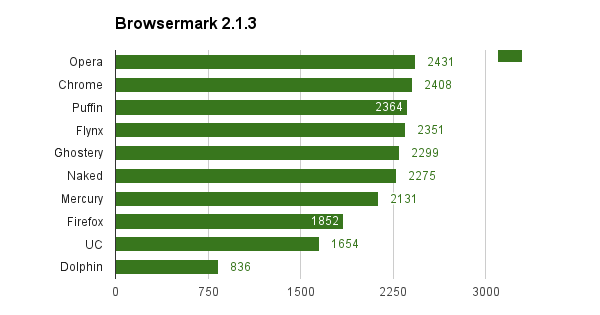 Our colleagues from the site AndroidAuthority.com conducted a study to determine the fastest browser for the Android platform. In this article we want to share with you the results. The experiments were performed on a smartphone Nexus 6P running Android 6.0.1 Marshmallow. Before the start of the test was made gadget reset to factory settings.During the tests on the smartphone absent any third-party software except for the above browsers and tools to measure the amount of free RAM. Before each test phase smartphone rebooted, then destroyed all data, settings, and the cookie cache test browser. Thus, we can say enough “clean” experiment, which minimized the impact of foreign elements. 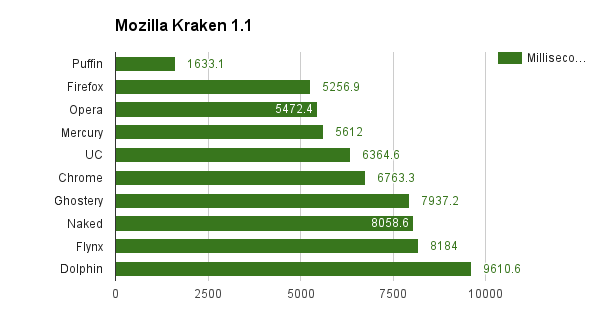 Kraken Benchmark based on the SunSpider test suite code, but Mozilla programmers companies quite significantly modified it. According to them, only in this way can be achieved the most correct results, reflecting the speed of execution of the tasks that occur in real life. In this test, too, with a noticeable margin wins Puffin Web Browser. This is a very well-known browser performance test from the company Futuremark.It consists of a series of five running test groups, aimed at testing different types of tasks faced by web browser. For each group of individual tests the ratings are calculated, based on which is formed the overall rating. A higher score means a better performance of the program. 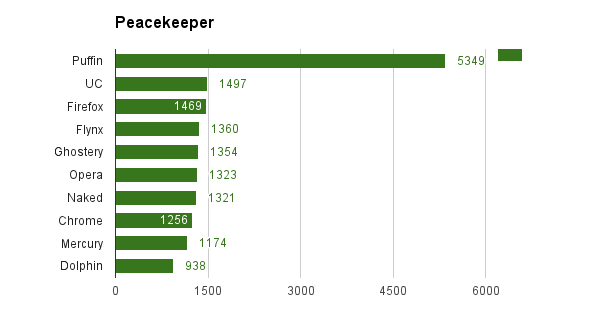 Again, Puffin Web Browser shows an outstanding result. 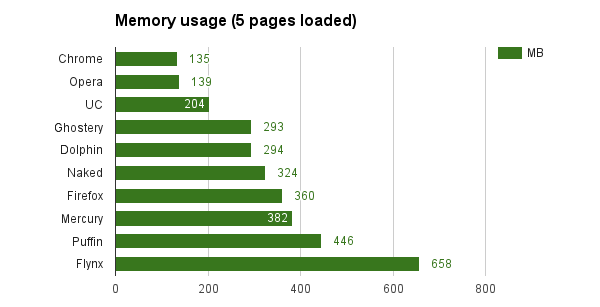 Consumption of memory is an important feature, especially for those devices that have a small stock of it. 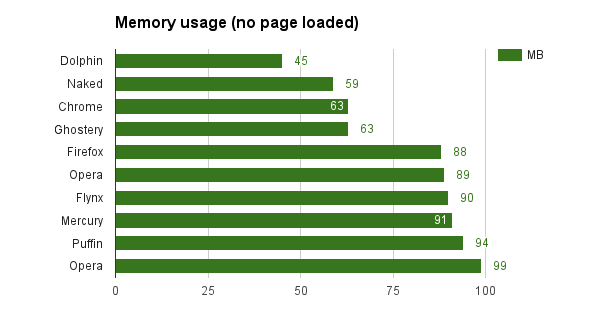 In the first test measured how much RAM is required for each browser when you open a blank tab. It won an unexpected outsider in all previous tests of Dolphin Browser. But with the opening of five tabs with different sites the picture changes dramatically. Here, the record belongs to Chrome, desktop version is so fond reproach immoderate consumption of RAM. Note that the favorite “high-speed” test Puffin in this case is on the penultimate position. 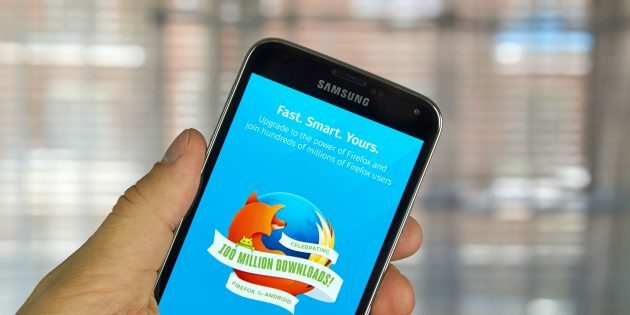 Graphs of the results of tests carried out relentlessly suggest that the role of the fastest browser for Android claims Puffin Web Browser. However, this is only true if your gadget has enough RAM. If you can not boast of its excesses, it is better to opt for the Google Chrome browser. He showed average results by page processing speed, but it turned out to be surprisingly economical. Personally, I was surprised by the results of these tests. And you?